A few weeks ago, we covered Money Moves to Make in Your 30s, but in covering the 30s, we missed a crucial period for many readers of Your Personal Finance Pro: everyone in their twenties! 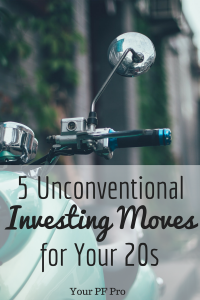 Many personal finance websites have already covered the standard things you “should” do in your twenties, like cut down on your latte habit and invest that $5 a day into an emergency fund. However, there are several unconventional ways to make the most out of your 20s. By incorporating these moves into your 20s, you’ll set yourself up for greater success in your 30s – and beyond! While some say your 20s are your time to “live it up” and enjoy life (i.e. spend money) as much as you can, take the unconventional approach and save your time – and money. By not going out and spending money on happy hours or fancy furniture, you’ll save money and use your greatest asset to build a large nest egg. Even if you’re only able to invest 5-10% of your money into your retirement account, you will have 50+ years to watch it grow. Unfortunately, many of your peers may not realize the power of compounding interest until their thirties or forties. Your twenties and early-to-mid thirties are the best time to leverage your youth, energy, and passion into your career. This means not settling for a job that you can only just tolerate. Invest in yourself by tackling new work whenever you see an opportunity. Whether you have to ask for it, or you’re given opportunities to tackle projects on your own, accept everything worthwhile that comes your way. Investing in your success early will pay off in dividends down the road. The beginning years of your career are crucial to your future success, as this is the period in your life where earnings can increase significantly. Early wage growth spells success down the line, as you’re more likely to continue getting raises, promotions, or other lucrative job offers. Don’t settle for a mediocre job because it’s easy – challenge yourself! Your twenties are a time to take chances and, potentially, fail. While you’re young and have more free time, invest in your skills and start a side hustle. Even if your job completely fulfills you in terms of challenges and new skills, there is always something else you could do to improve your prospects. Invest in learning a new skill, whether it’s improving your writing, coding skills, or even something unconventional like wilderness survival skills. Baby boomers often disparage millennials for their poor credit scores. Whether or not you were taught how to manage money, now is the time to prove your parents or their friends wrong. If you somehow have escaped your early twenties with absolutely no debt (auto loans, student loans, credit card, etc. ), it’s time to take on some debt responsibly. Think of building credit as a long term investment in yourself. It’s clear that you can use credit cards to your advantage – just check out the posts on how to successfully manages dozens of cards. However, you don’t have to even your cards that much to become financially responsible. By charging small amounts to your credit card and paying off the balance in full every month, you’re well on your way to achieving a stellar credit score. This investment will pay off down the road when you’re applying for an auto or home loan. Also, don’t forget, some companies screen potential hires credit scores, so having a good score is a long term investment for your financial future. Even if you never plan on starting your own business or side hustle, you’ll still want to invest in your brand. Investing in your brand means monitoring and shaping up your online presence. Time to take down those Facebook photos of you partying in college, or making obscene gestures (not that any of us has ever done that…). If you’ve neglected checking your privacy settings on Facebook, or reading through your old tweets to make sure you haven’t said anything you would regret, now is that time. Like it or not, everything we say online is viewable to everyone, including current or potential employers. Go through your old posts throughout the web, and reconsider anything controversial you may have posted. If it’s not something you’d want blasted on the front page of a newspaper (or BuzzFeed article), take it down. Better to be safe than sorry! Counterbalance a negative (or empty) personal brand by sharing good stuff about your career and accomplishments. Send out tweets touting an accolade you received at work, or share interesting Facebook posts about your industry. Make yourself a reputable source who is focused on their career and improvement. A positive personal brand will go a long way toward making a positive first impression on any potential employer. If you’re looking for more traditional investing information, a great resource is Fisher Investment Guides. These guides will help you understand your net worth, how to invest in IRAs and 401(k)s, and more. Whether you’re in your twenties or beyond, Fisher Investment Guides are a useful resource to help you understand complex investment questions. 3. understand your true interests. May be you studied politology in the university but are passionate about literature? Grab a few classic books in the library and enjoy yourself – it’s time to develop your unique personality that will attract people and make you interesting in the eyes of your friends. Another GREAT post with High level thoughts for those starting out / fresh out of college!! Life is full of options for those willing to investigate!! I would recommend everyone have a side hustle especially in your 20’s. 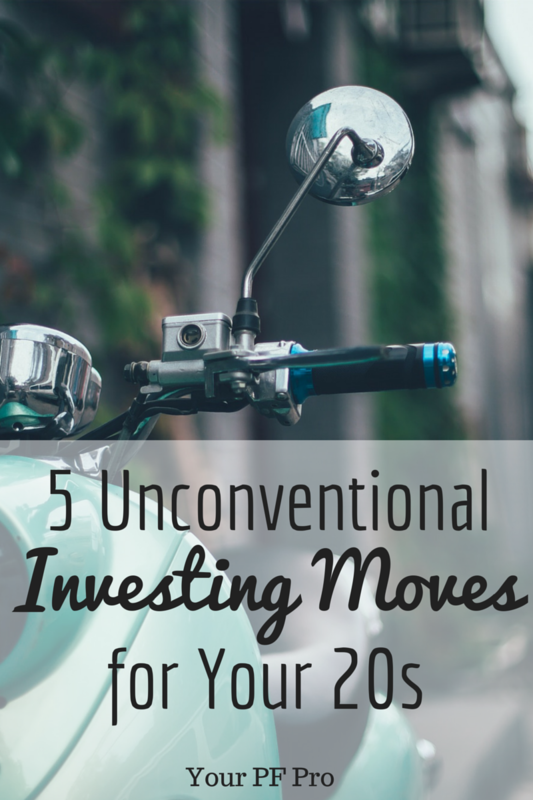 Time is definitely on your side in your 20s for investing. The sooner you start the better. I also like the idea of building your confidence. At my first job out of college they had a public speaking group where a handful of people would get together after work to get over their fear. Looking back, I wish I had joined in to build up my confidence. Who knows how much further ahead I would be now!